It’s been eight years since Smith Gee Studio turned on the light switch, and we have a lot to be proud of. “It seems like just yesterday we had started, and then we celebrated 5 years, and now we are celebrating eight years. I can’t believe it! I’m so thankful that we still have great work to be done.” – Fleming Smith. “Over the past eight years we have been shaping who we are. We are proud to have each one of our employees be a part of creating our identity.” – Hunter Gee. “I am most proud of the people that we attract and have hired. 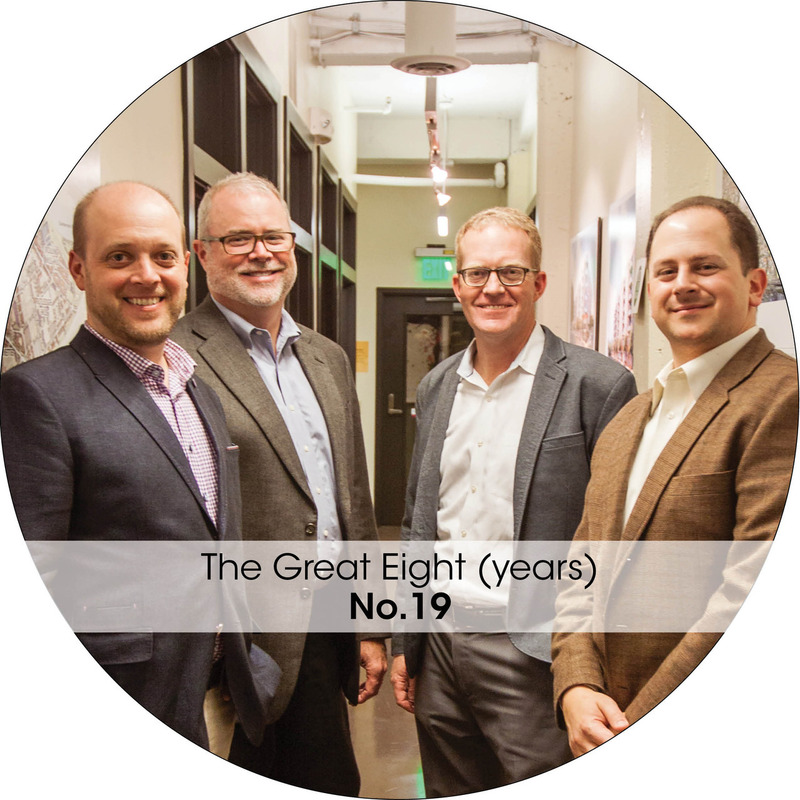 I firmly believe that we have the best group of people to work with and our clients feel the same.” – Greg Tidwell. “When pitching the idea to start a firm to my wife, she said that there has to be a reason. I quickly answered that these are the only 3 people whose core values align with mine. They were the only people I would want to start a firm with, and to this day I am so glad that we did.” – Dallas Caudle. How did Smith Gee start? It all started by working for LRK. The firm had 9 offices, one of which was the Nashville office. Ninety percent of the projects that LRK had at the time were in the housing market in some way. During the boom they grew fast, but when the recession hit they began laying people off pretty quickly. They had to close 3 offices and the Nashville office downsized from 30 to 5. Greg, Hunter, Dallas, and Fleming all recognized the obvious of what was coming in their future and decided to be proactive. At the time they were working under contract but were in communication with LRK about next steps. The four of them began speaking with their financial advisors and people they trusted in town. Some people thought they were crazy at the time to throw out the idea of starting a firm. But other people (that have more money than any of the four of them combined) told them that if they were prepared to take a little risk, it was the perfect time to start a business. Flash back 3-4 years, Hunter and Fleming are getting off a plane and look at each other. They realize that none of the work they were doing at the time was in Nashville. They were both born and raised Nashvillians, were once really involved in the community, but over time they were no longer doing any work within their hometown. So both of them decided at that moment to change that. They got re-involved with the community. Hunter met with T.K. Davis and Burt Mathews and talked about forming the Urban Land Institute chapter in Nashville. They got on boards (some of which they are still on today) and got back to being engaged. Doing that for 3-4 years as LRK was down-sizing and the recession began to hit, really set them up for the launch of a new company. It wasn’t something they realized at the time, but they were already building the foundations of the firm to be. When they decided to start taking steps toward opening a firm, one of the trusted people they sat down with was Burt Matthews. He told them to make a list of 50 prospective clients, to start at the top and to call each one and invite them to breakfast/lunch. Fleming and Hunter made it a point to go to at least 3-4 client meetings a week until they met with everyone on the list. At the time, everyone in the industry was knocking on doors and doing any work they could just to stay a-float. It was an exhausting time. So when they put together a plan to start the firm, they were re-energized. They had a new story to tell, were poised and were excited. We had no idea when the recession was going to end, but we knew we were hopeful. This was about the time that “connecting the dots” came about. During these meetings we realized that everybody was begging and beating down the same doors. To change the conversation we decided to approach jobs with the intent, “what do we need to do to make your business grow and make a project happen? Who can we connect you with? We aren’t asking for you to give us something, we’re asking for you to help us create something.” This really resonated with people. The first year of Smith Gee, we had a lot of exciting projects. We had people sitting by the microwave oven, and were just doing everything we could to make things happen. We went after some really cool proposals, one of which was Ryman lofts. It was an artisan loft project that everyone in town wanted and was going after. Other firms that had been around for a while had their standard boiler plate RFP/RFQ submission. Since we didn’t have any of that, we made one from scratch. We had an idea about how to go about the design, but we didn’t think we had much chance at winning. We decided to throw our name in the hat regardless. We had a really interesting idea to involve the artist in the design process. Hunter called the arts commission and asked is we could get artist to help us with the design, and made sure to write that design intent into our proposal. These details along with our strong multi-family experience plus some relationships that we had for a long time lead us to land this job. Much to probably every other firm in town’s surprise, we were only 4 months into business and we landed this awesome project. About the same time, Kara Gee had come into the office to help with marketing materials and answer the phones. She had a lot of previous experience with Tuck Hinton and IDS in her career, and word got out that she was “back in the game”. Smith Gee’s phones began ringing from office brokers and previous client connections for potential tenant work. We were approached to submit a proposal for the largest office tenant job downtown. DVL (an old public relations firm) was moving from the old YMCA building downtown over to the Gulch with the intent to refresh their brand for new talent. We ended up winning the job and again caught the attention of our peers. We had been in the game for a long time, but not on our own. These initial big projects were what put us on the map and gave us the momentum to keep growing. As we started to grow we were able to hire back most of the people that had to be let go from the downsizing of LRK. It was inspiring to be able to work with people we trusted again. All of these experiences have helped us prepare for the firm’s future. We are particularly proud of what we have done in just 8 years, and we are blessed to have stayed so busy. We are just getting started! Cheers to 8 years!